This classroom solved a number of problems in small groups. 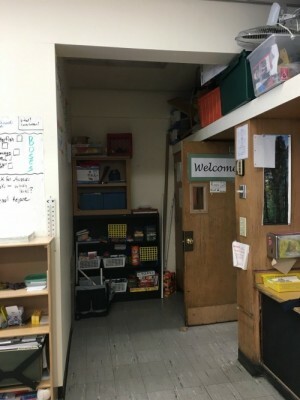 These are two of the problems solved during the classroom renovation. Problem Statement: Third grade students from an urban school become aware that a corner of their classroom is darker than they’d like. Design Goal: To brighten the dark corner. A group of four students experimented with different combinations of batteries and bulbs making a number of working circuits. 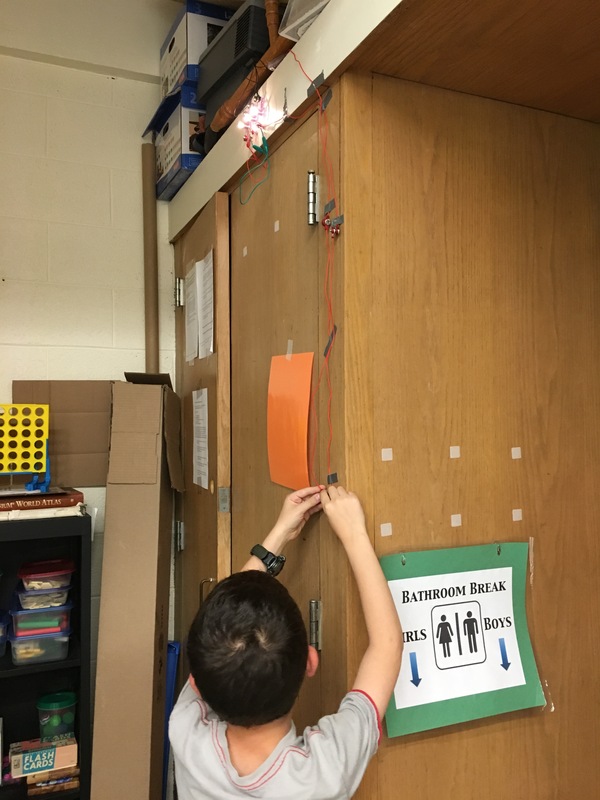 After a working circuit was created, they worked on other smaller problems such as how to easily change the battery, how to attached the circuit to the wall, how to keep all the pieces of the circuit securely attached together, and how to create a switch all students could access. 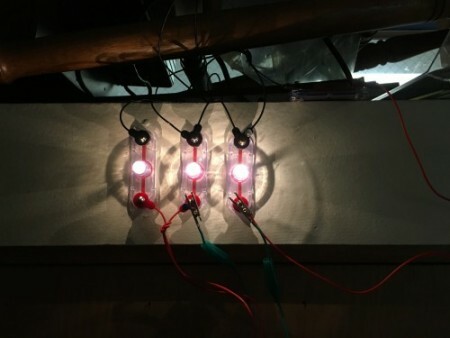 The team connect three small light bulb holders in a parallel circuit. The switch was created by connecting two alligator clips together. Next Gen Sci Standards, Gr. 3 Physical Science (3-PS2-3): Ask questions to determine cause and effect relationships of electric or magnetic interactions between two objects not in contact with each other. Next Gen Sci Standards, Gr. 4 Physical Science (4-PS3-2): Make observations to provide evidence that energy can be transferred from place to place by sound, light, heat, and electric currents. Next Gen Sci Standards, Gr. 1 Physical Science (1-PS4-2): Make observations to construct an evidence-based account that objects in darkness can be seen only when illuminated. Common Core Math Standards, Gr. 3 Measurement & Data (3.MD.D.8) Solve real world and mathematical problems involving perimeters of polygons. Common Core Math Standards, Mathematical Practices (MP1) Make sense of problems and persevere in solving them. 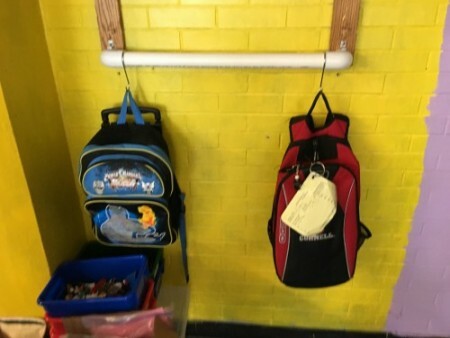 Problem Statement: Third grade students from an urban school realize the backpack and jacket storage area is too cramped and crowded. Design Goal: To A storage solution that allows for more space and different sized bags and jackets. Existing hooks assume everyone needs the same amount of space. 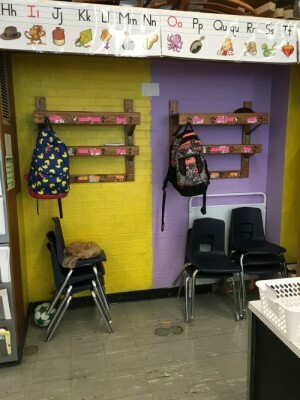 A group of three students cleared clutter and installed more adaptable storage unit comprised of a PVC pipe, 90 degree elbows, and S-hooks. The students debated amongst each other how to best attach the PVC pipe to the existing structure. The original plan, constructed with the aid of the teacher, did not work. Students were integral in the making of the device, using hand tools with the aid of the teacher. Next Gen Sci Standards, Gr. 3 Physical Science (3-PS2-1): Plan and conduct an investigation to provide evidence of the effects of balanced and unbalanced forces on the motion of an object. Next Gen Sci Standards, Gr. 2 Physical Science (2-PS1-2): Analyze data obtained from testing different materials to determine which materials have the properties that are best suited for an intended purpose. Common Core Math Standards, Gr. 3 Measurement & Data (3.MD.B.4) Generate measurement data by measuring lengths using rulers marked with halves and fourths of an inch. Common Core Math Standards, Mathematical Practices (MP6) Attend to precision.